p 40 Really sorry Catrin… I did spell Maxwell’s name wrong too though, so at least you are in good company. 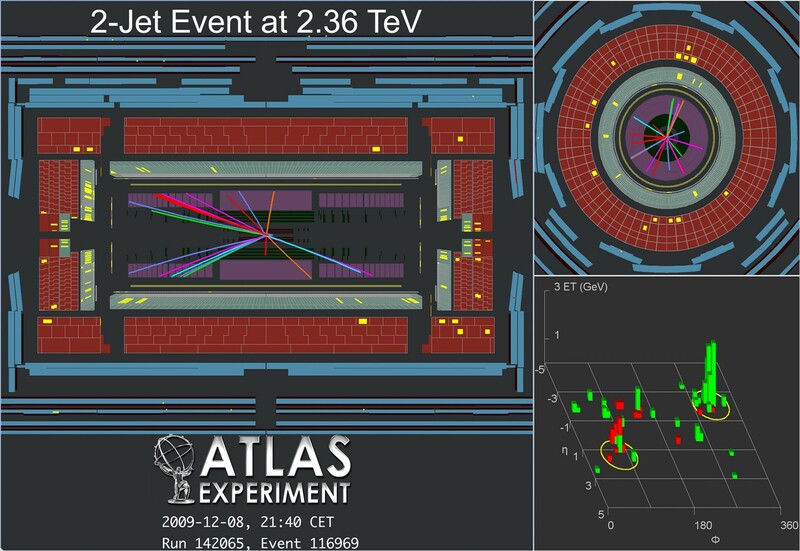 Anyway, here’s that 8 December event, the first with energy higher than the Tevatron, from the ATLAS event display page. p 56 Peter Jenni points out that the ATLAS liquid argon calorimeter actually detects the electric current pulse which is induced by ionisation in the liquid argon, rather than directly detecting light, as is done in some other calorimeters. Still, the principle is much the same. More specifics on how the ATLAS calorimeter works are available here.